cooked it from 290-310 degrees for about 2.5 hours until flat was 160. foiled and cooked an additinal 2 hours until flat was 200. let rest about 2 hours before slicing. taste and texture were good on the flat but the smoke ring was unimpressive compared to a low and slow cook i typically do. also the point was not cooked enough to be tender like it normally is. i had to cut it into cubes and then finish it in the oven for several hours before it was right on!! I would guess you got it up to temp and cooked it but the tissue didnt have the time to break down and become fully tender. wondering.... did you inject at all, or any liquid in the wrap? yes i injected it with beef broth and kosmos brisket injection like i normally do. i did not add any liquid to the foil (and i also don't when i cook it low and slow) there was a ton of liquid in the foil at the end. so whatever angle I could provide, take w. some grain of Kosher sea salt !!! I cook in that range all the time. I don't use foil. If I inject it is only on Select grade and it is strait Canolla oil. I don't take temps on the meat I cook by feel. It has to probe like butter IT is useless. I don't think you cooked it long enough.The last packer I cooked was 11.8 when it went on the pit it didn't probe tender until it was almost at 6 hrs. Both point & flat where as tender and moist as a cheerleader with hot pants. Ya, if the smoke ring is important you can even use some cure. 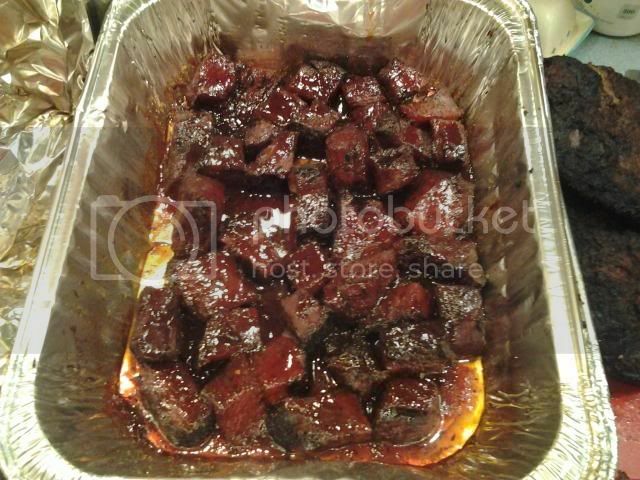 OTW, those burnt ends look fine. Just need some pickle, onion, and a pile of white bread to get down with those. 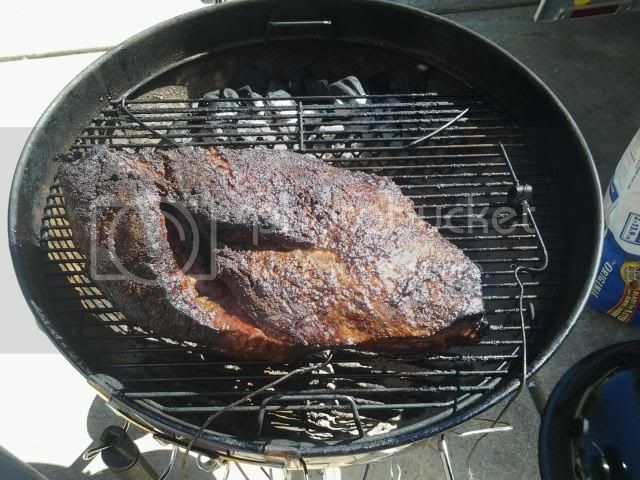 rgwiazdzinski, your brisket does look mighty tasty. My advice is leave here and go back to low and slow forum. That brisket could be cooked at 250° and easily hit finished temps in 12hrs with foiling and a smoke ring as deep as the heart of Texas. 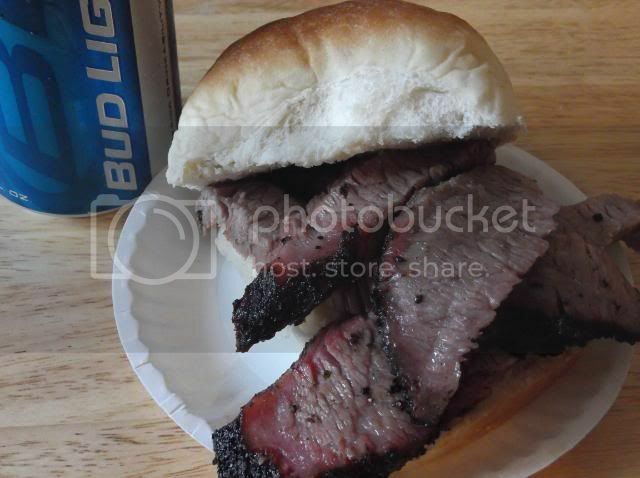 Low and slow brisket is a time honored tradition in Texas, heck even the big dog raunt folks know this. They may cook clods and pork hot and fast but they know the briskets need the low and slow if your not injecting. You lost the smoke ring because of the hot and fast sealing off the meat to fast, why cure the meat with additives like more salt when it can happen naturally when cooked like it was meant to be. As far as foil goes yes it is a crutch right along side butcher paper both create a brazing effect in my opinion. I would rather use a crutch than pump cooking oil in my brisket. I was a firm believer in no foil and letting the briskets go with no foil at low temps but as the meat industry has changed so has marbling in briskets, meaning that even CAB briskets can let you down. They are much leaner and do not like the lower temps with out help in my opinion. I prefer not to inject outside of comps so I foil instead. IDK Franklins, Snows, Kruetz and Blacks all run pits between 275-325 the smoke ring stops forming at 140 deg how fast it gets there at BBQ temps (250-350) has nothing to do with it and smoking temps. (1-249) there may be a slight advantage, a smoke ring has nothing at all to do with overall flavor it is an appearance thing. As to injecting some oil folks have been larding lean cuts to increase moisture and flavor for centuries I only inject select graded brisket choice & prime never see a needle. I inject oil, you use foil, I cook around 300 and get plenty of sleep you go L&S and get less, there is know right or wrong only different trails to get to the same place. there is know right or wrong only different trails to get to the same place. 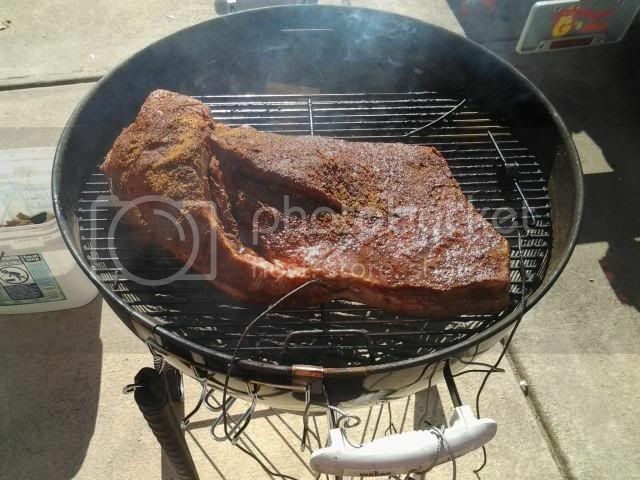 To get a better smoke ring on a hot and fast, light the fire and put the meat on immediately. This method got us a brisket call at the Jack!! Dan, did any low & slows walk after you? You identified your problem in the third statement where you said you cooked to 200. Ya don't cook any low an' slow type meats to temp. Ya use temp to alert you that thay are gettin' close ta done in larger cuts. They don't all give up at the same temp. Ya test for doneness different ways for different meats. With a brisky you probe for doneness. Once it probes with a buttery smooth consistency you're good. For butts for pulled pork it's when the bone can be pulled out. OK, ya got me on sliced pork. I missed one cook to temp. Cook it to about 185-190. For ribs it's when they pass the bend test and/or probe smooth with a toothpick or the like. k.a.m. - Apologies for not replying sooner, been working on post hurricain recovery and restoration of electric generating plants. Don't really know the answer but there were only 4 who finished higher. Dan, my apologies for not saying Congrats on your call I was lost in the moment. Thoughts and prayers to you and everyone effected by the storm my Friend. k.a.m. - THANKS. I was part of a great team, Pigs in Blankets. We thank everyone from Texas who helped us out after the storm. 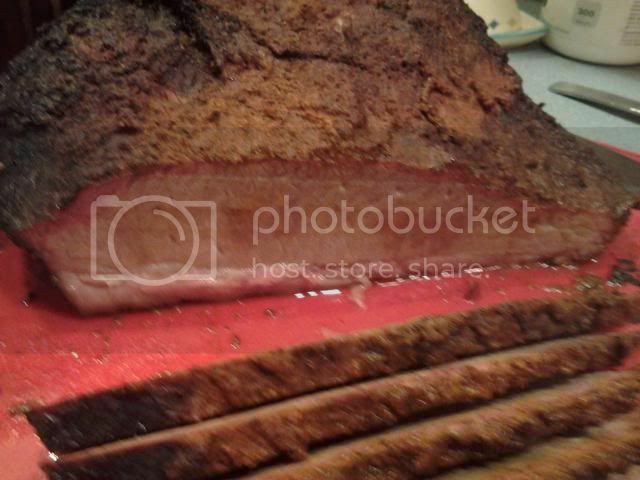 Saw on a different website a group that was doing well in competitions doing brisket at 400. They said its a big steak so we cook it like a steak.